Look out Wal-Mart! You may have AC/DC, but Best Buy has Guns N’ Roses! Guns N’ Roses will release their first album in 17 years, “Chinese Democracy,” on November 23, 2008 exclusively at Best Buy. Pre-orders for the album through the company’s Web site began today. 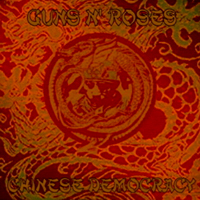 The first single from the album, called “Chinese Democracy” after the album name, also premiered today on the radio. Guns N’ Roses’ last albums were “Use Your Illusion I” and “Use Your Illusion II.” These two albums were released simultaneously in 1991. Overall, the band has sold 90 million albums worldwide. Axl Rose, the band’s lead singer, and Caram Costanzo produced the new album, which will be released on Black Frog/Geffen Records. The album has 14 tracks. “Shackler’s Revenge” debuted Sept. 14 on the videogame Rock Band 2, and “If The World” debuted in the movie “Body of Lies” premiered Oct. 11. “Chinese Democracy is one of the most highly anticipated albums in music history, and Best Buy is thrilled to deliver this explosive and previously elusive release to Guns N’ Roses fans,” said Gary Arnold, Best Buy’s senior entertainment officer, in a press release.